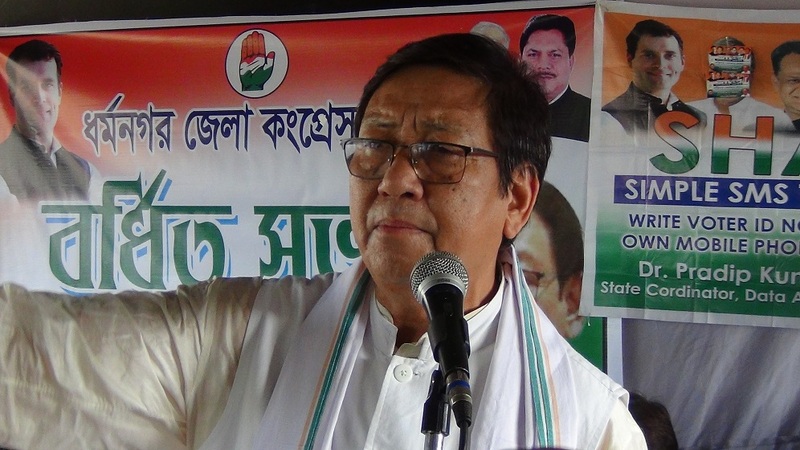 Under the initiative of the Dharmanagar Block Congress, a convention was held at the conference hall of Congress Bhawan in Dharmanagar of Tripura on Monday. Supporters and members across the North District participated in the meeting. Tripura Pardesh Congress chief Birajit Sinha along with other Congress leaders including Nirupam Dey, Kohinoor Roy, Ajit Das and other Congress leaders remained present in the meeting. The meeting was organized under the banner of the ‘Congress Apke Dwar’. It is a drive launched by Congress president Rahul Gandhi. Under this drive the Congress supporters have visited door to door and have learned about the problems of the people in the village areas especially. Addressing the meeting, PCC chief Birajit Sinha stated that during the drive they have witnessed that the condition of the people in the village areas is extremely critical. They don’t have access to food, water or treatment. A village is Gandacherra have no access to any work not even the MGNREGA is provided to the villagers. However, after visiting every doorstep the Congress supporters will report the matter to the Congress president Rahul Gandhi.